Last Software Update: 1st April, 2019. Marketplace & Reveals Lucrative Kindle Niches - In Seconds!" Love the Kindle Spy software to help me see trends in the industry, as well as verify how I am doing, in a snapshot graph, compared to other authors in my genre. I also use it when I'm contacted by authors I don't know, or when I want to learn about what successes others are having that I can learn from. I've always preferred doing my book research ON Amazon, and now I have an assistant with me to tell me what I need to know in seconds. My research used to take hours – not anymore. With one click I can understand the landscape in any category in a matter of seconds ... and then, a book topic idea is given based on the best selling books in that category. One of the best tools an author can have in their toolbox for finding the right category to get ranked in, identifying keywords and tracking your books and those of other authors for sales ranking! "It gets better with each version ..."
"Levels the playing field in so many ways..."
When you want a detailed breakdown of any Kindle or Book category on Amazon, just click on KDSPY from within your browser, and in mere seconds, you'll know the competitor landscape of that category, the potential est. profit you could make there with a first page listing – PLUS you'll have a detailed breakdown of each book's performance. Once you've identified an ideal category, a simple roll-over with your mouse on the red 'information' icon will reveal the est. DAILY sales you'll need for Amazon's algorithm to pay attention to your book – highlighting how to rank #1 and #20 in any given Kindle or Book category. What better way to find bestselling niches – and get ideas for your next book – than by modelling what's already working for other top authors. 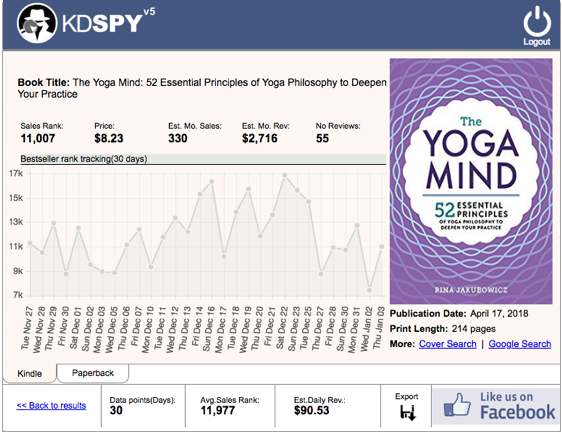 KDSPY shows you the hot trends in any market, reveals the bestselling niches to go after – and even gives you a world cloud to help you write a compelling book title. Do any keyword search in KDSPY itself and instantly get 100's of additional (A-Z) keyword suggestions – all exportable for AMS ads – along with competitor counts and their est. monthly revenue. Plus, deep-dive into any single keyword for our 'colour-coded' competitive analysis. It doesn't get any quicker than this to research keywords. KDSPY can analyse any author page and tell you in seconds all their statistics. Just a single click will show you the SalesRank of all their Kindle, Paperback & Hardcover books, their estimated sales, and total revenues broken down by individual book type. Keep track of as many Kindle, Paperback & Hardcover books as you'd like with our book tracking feature. 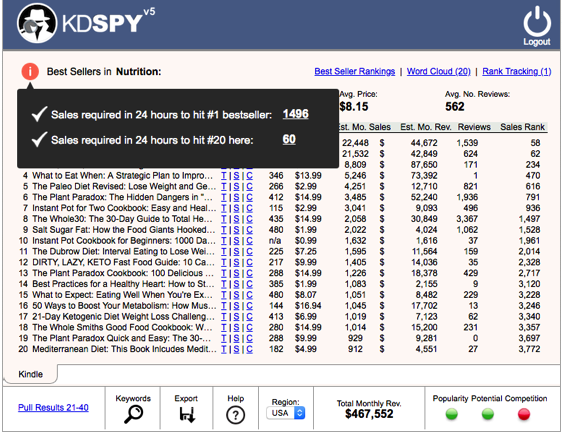 KDSPY pulls the SalesRank of your competitor's books and displays their rank in chart form along with their est. DAILY sales averaged out over the month. What better way to discover 'consistent' selling books & niche topics than by following sales performance over-time. 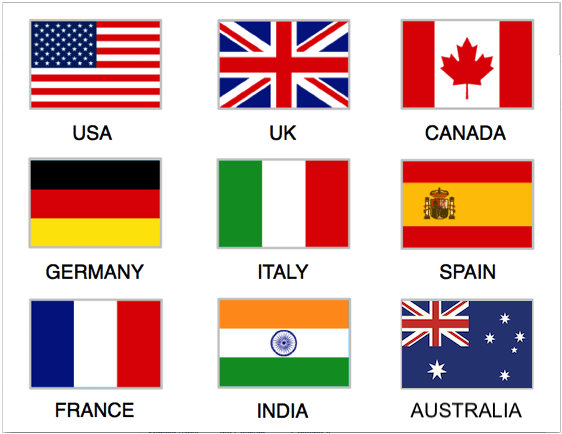 That's right – even though you can use KDSPY from anywhere around the world ... KDSPY v5 also gives you "country-specific" data from Amazon stores in; USA, UK, Canada, Germany, Australia, Italy, Spain, France and India, too. KDSPY v5 integrates directly into your browser. That means you can do your research right on Amazon, not with some lame software buried on your computer. Who remember’s to use those? Not me. 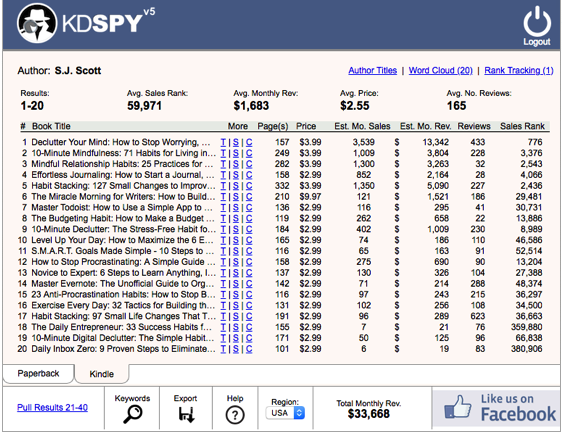 KDSPY v5 was painstakingly coded from the ground up to be the quickest Kindle research tool on the market. 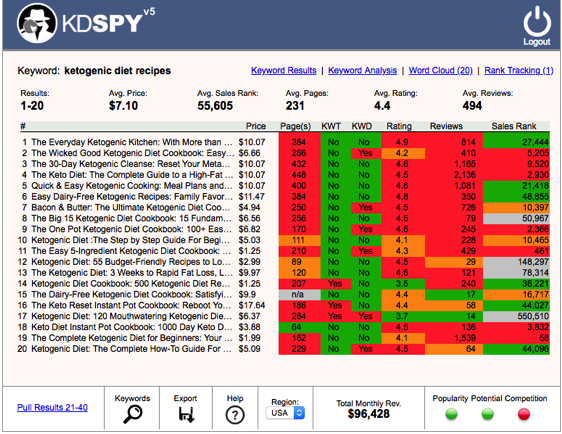 Plus, the data that KDSPY reveals is available from a single click while your browsing Amazon. I feel like a kid in a candy store. This product is a Godsend. I have a book on Kindle and after using KindleSpy, I can see now why it's not selling as I thought it would. I have already gotten ideas for my next books. I can't put in words the excitement. It has truly taken the guess work out of publishing on Amazon. I've been publishing on Kindle for around 18 months. I'm now consistently earning between $8-10k per month for the last 3-4 months. If it wasn't for KDSPY, I don't know how else I'd be able to find all these profitable niches. I love the bonuses you offer too, especially the Excel ROI tracking spreadsheet that allows us to keep track of the profitability of our books. Thanks so much. 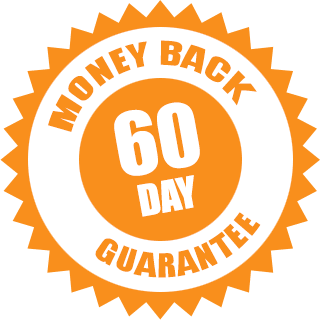 We're so confident that KDSPY will save you time and make you more money that we offer a full 60-Day – no hoops to jump through – Money Back Guarantee. "You've really created a fantastic tool!" "This levels the playing field in so many ways!" "Started finding great niches right away!" "KS4 is a remarkable piece of work!" "The search facility is hugely time saving!" 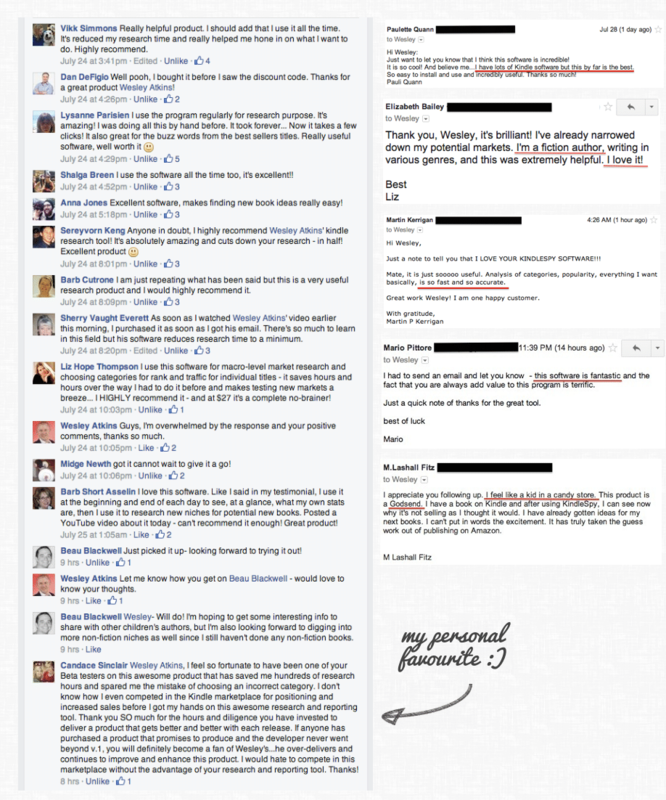 Here's some unsolicited Facebook comments & emails from our early beta testers of V1. "Wesley, Just wanted to let you know that KDSPY is my new favorite tool for Kindle research - it blows everything else away! It's lightning fast and super-simple to use. I've been using it the last few days..and all I can say is I wish I had this years ago. Great work!" I've been using KDSPY for about 2 weeks and color me impressed! This is saving me hours and hours of outsourcer time to pull all of this info together. I can analyze markets now in a 10th of the time I used to spend." I was fortunate enough to get early access to KDSPY and I have to say, it's awesome. I can now go into Amazon and make far more informed decisions about what book topics to go after. I used to enter niches randomly in the past, KDSPY changed all that. Yes. Absolutely. KDSPY will analyse all the Kindle, Paperback or Hardcover books in a category and give you an export of the results in under 29 seconds. But that’s not all. 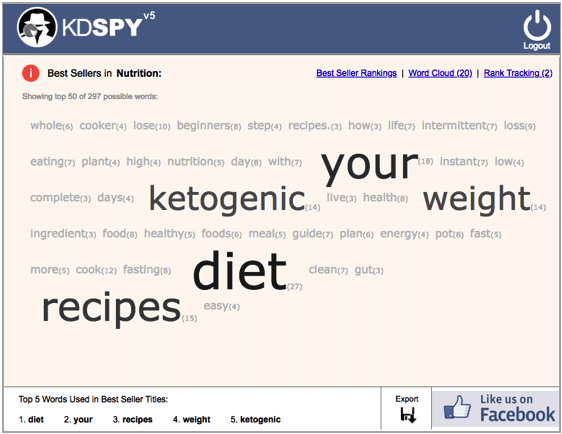 KDSPY will also allow you to export the word cloud, keyword results, author analysis and tracking data. Yes. KDSPY will work anywhere in the world to pull data from one of the support stores. Originally KDSPY was created to pull results from the largest Amazon marketplace; the US. However, due to popular demand, KDSPY v5 now supports results from specific stores in the UK, Canada, Germany, Australia, France, Italy, Spain & India. If I get enough requests, I will also consider adding other countries too. Yes. If you lock yourself in today for the insane price of just $47 (one-time) – that’s all you will ever pay. You will get ALL future fixes & feature updates to the software. And I plan on making a lot of improvements based on user feedback. Heck, we’ve made over 224 updates and rolled out over 20 advanced features since this was originally released in July 2014. Does this work for fiction authors? KDSPY is programmed to work on Google Chrome and Mozilla Firefox. Due to the declining popularity of other browsers, it will unlikely be supported on any others in the future. "...now nearly every book I publish is a bestseller!" "...opened my eyes to the untapped potential"
I am quite new to Kindle and found it quite difficult to understand how to do proper research and understand what categories to focus my energy in. 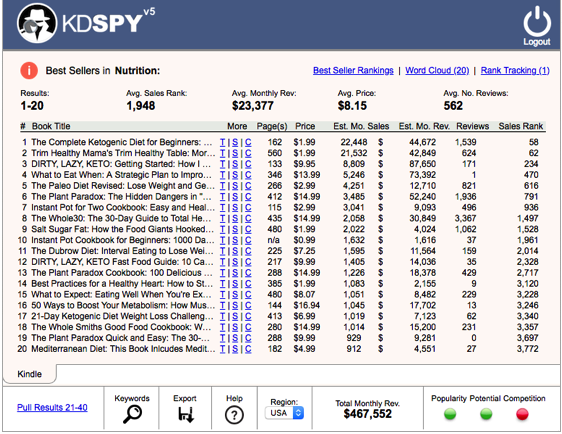 KDSPY cuts out all the legwork and in a matter of seconds you get a complete and detailed spreadsheet with upto the minute average sales revenue, amazon best sellers rank, number of reviews and total revenue for your chosen niche. It's invaluable and certainly opened my eyes to the untapped potential awaiting kindle publishers. Another plus is the "word cloud" feature of the top keyword in the titles per niche. That alone is a goldmine and we all know the power of a popular eye catching title! However, despite all these features and benefits, Wesley's constant hands-on backup support in answering any queries I had about using KDSPY and his willingness to listen to feedback sets this product apart from others I have brought. If you are looking to grow and rapidly expand your Kindle publishing empire, KDSPY will get you there faster. KDSPY (known previously as Kindle Spy) is not affiliated with Amazon or any of its subsidiaries.